Most of Europe’s renewable energy is bioenergy. That means burning a lot of biomass – but what is bioenergy exactly? Bio-energy (from the ancient Greek bios, life) derives from organic materials, such as wood, agricultural crops or organic waste. It is obtained from recently grown organic material, known as biomass, as opposed to fossil fuel, which is ancient fossilized biomass. It can be used in electricity, heating, cooling and transport. It can be used in liquid forms such as biofuels, in gaseous forms like biogas, or in solid forms, as is the case when burning wood for energy. Bioenergy is the oldest form of energy used by humans but it’s also at the front row of Europe’s current efforts to move away from fossil fuels and decarbonise our economy. As a result of Europe’s climate and energy policies, use of bioenergy is rapidly growing. Bioenergy, however, does emit CO2 and its extraction can cause a host of environmental problems. What exactly are we burning? Bioenergy is energy from different kinds of organic matter. European policies consider all bioenergy to be renewable energy and in fact 2/3 of renewable energy (Eurostat, 2014) is bioenergy (while renewable energies made up 15% of the EU’s total energy consumption in 2013). In the EU today the most common source of bioenergy is forests; branches and tree tops, whole trees from thinnings or from final harvest, even stumps, as well as recovered wood waste are all included. Half of the renewable energy used in the EU in 2011 came from wood (AEBIOM, 2013). Considering that the promotion of renewable energy is probably the most important measure from the EU in the fight against climate change, much hope currently lies on the performance of bioenergy. Figure 1. Consumption of renewable energy, EU-28, 2011 Source: AEBIOM, Eurostat 2013. About 20% of all renewable energy consumed in the EU is made from agricultural products and residues, as well as from waste. Food and feed crops are commonly used for energy in the transportation sector in the form of biofuels. These biofuels are mostly being made from rapeseed and other vegetable oils (biodiesel) or from sugar crops (bio-ethanol). Maize is often used particularly for biogas production to produce electricity. Roughly 10% of the different kinds of biomass used for heat and electricity are imported from outside of the EU. This share is expected to reach 15% by 2020 (European Commission, 2014). The majority of these imports happen in the form of pellets made from wood. The biggest importing regions to Europe are the USA, Canada and Russia. Import routes from Ukraine, Brazil, South Africa and other African countries are also emerging. Of the biofuels used in transport, more than one third are imported from outside of Europe, with Argentina, Indonesia and Brazil being the most important sources of imports. What is bioenergy used for? Bioenergy has been mostly used for heat production in the EU before the policies that incentivized the use of biomass for energy kicked off. 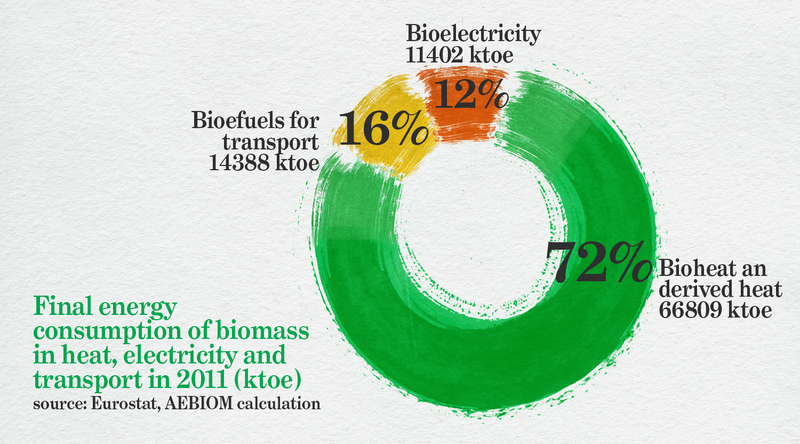 In 2011 72% of bioenergy was consumed as heat, 16% as transport fuel and 12% as electricity (AEBIOM, 2013). Relatively much more biomass raw material is used in electricity and transportation than their share of energy consumed, since conversion of biomass to electricity and transportation fuel is much more inefficient than for heat. Volume of biomass input is three times bigger than the energy output, when biomass gets converted into electricity. The use of biomass in the transportation sector and for electricity has been growing most rapidly (European Commission, 2014). Whereas use of biomass for heat is expected to grow by 25% between 2010 and 2020, the use of biomass in electricity and transport is expected to more than double. Figure 2. EU bioenergy consumption in 2011 for heat, electricity and transport fuel. Source: AEBIOM, Eurostat. The contribution of bioenergy to EU energy consumption is expected to more than double from 2005 to 2020, reaching 124 Mtoe. Demand for biomass for energy is projected to keep on growing further. By 2030 the EU would already need 178–192 Mtoe of biomass, depending on the EU policy framework chosen (European Commission, 2014). Growing demand is creating pressure and competition over particularly wood resources and over land to grow crops. Several studies have already concluded that the demand for wood from the energy sector, combined with demands for the paper and pulp, wood working and other sectors exceeds the EU’s own sustainable supply. Such projections don’t yet even account for possible new demands from arising bioeconomy policies. Additional land that could be cultivated to grow crops for energy is also very scarce in the EU, if negative impacts on important habitats such as grasslands and displacement of food production are to be avoided. Studies estimate that only a maximum of 1.3 million hectares of land, corresponding to about one-third of the area of the Netherlands, could be sustainably available for energy crops. Figure 3. 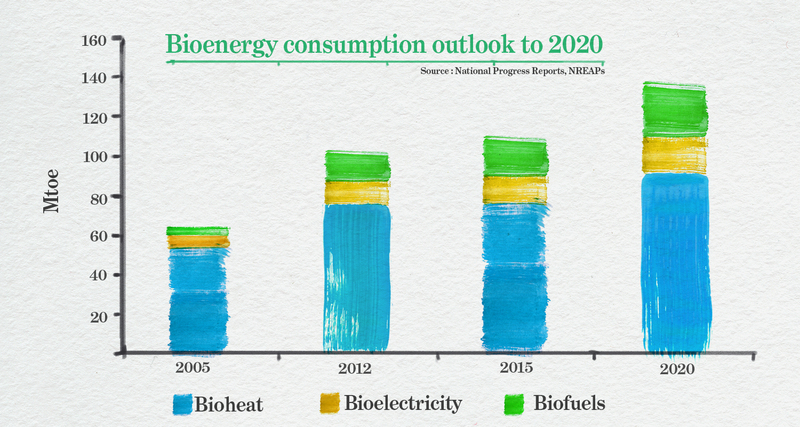 Bioenergy consumption outlook to 2020. Source: European Commission, 2014.